Head to Thailand in the wet season and you can save hundreds of dollars, travel editor Winsor Dobbin discovers. If you really want to travel on a tight budget then visiting Thailand in the off season is highly recommended. From May to October, the period the locals call the green season, prices drop dramatically and there are far fewer tourists. Many guidebooks advise against visiting during the monsoon period –when there is often serious rain and seas can be seriously rough. If it is raining, however, you can always catch a movie, have a massage or read a book. The downpours seldom last more than an hour or two. Any inconvenience is countered by ludicrously low prices. You must, of course, be sensible with your choices. It is easy to be lulled into a false sense of security when enjoying sunshine, beaches and cheap beers. That’s why so many visitors come a cropper when riding barely-roadworthy motorbikes without a crash helmet after a dozen cans of Chang beer. This green season the Tourism Authority of Thailand (TAT) is encouraging travellers to remain extra vigilant by following all safety rules and guidelines. Visitors are also advised to keep up-to-date with daily Thai weather forecasts by the Thai Meteorological Department (TMD) on impending storms, heavy rains and rough weather. If it is a particularly torrential monsoon shower, many tourist activities are curtailed or delayed if tour operators are responsible and think that there are undue health and safety risks, or threats. Others may just go ahead anyway. Activities likely to be affected include: mountain trekking, white-water rafting, zip lining, bungy jumping, snorkelling, sailing, diving and ferry transfers. If your ferry looks like it doesn’t have enough life jackets, or like it could catch fire at any moment, wait for a better option. And if swimming under a waterfall looks risky; think again. May to October sees the Thailand monsoon season sweep into the southwest, with the next few weeks bearing the brunt of the rains. Many of the smaller islands are shut down during the monsoon. The TAT advises “island crossings by ferry are going to be choppier than usual in the monsoon and must be scrutinised on an hourly basis even if a ticket is already purchased”. Travelling when the next boat is ready can be a wise investment in staying alive. You don’t have to stay in a chain hotel in Thailand; good western style hotels can cost as little as $25 per night off peak. One of my best discoveries of the year so far is the Crystal Beach Hotel. Located on a laneway just 100 metres from the beach, the Crystal Beach met all my search criteria: air-con, double bed (not two singles pushed together), free wifi, swimming pool and central location. Even a balcony. I paid $33 per night for two nights via an online booking service then negotiated the hotel down to $25 a night so long as I paid cash. The Crystal Beach might not be for everyone. It is on a busy soi with massage shops and restaurants, so can have some evening noise if you are on lower floors (I had no problem on the fourth). It also does not have its own restaurant but with dozens on your doorstep that is not an issue. You’re probably thinking what is the hitch? A shared bathroom perhaps? Nope. My room had its own shower, toilet and basin, hairdryer, soaps, shampoos and body washes. The bedroom also boasted a small fridge, a phone, in-room safe and kettle, as well as several well-located power points and good lighting. There is a TV with several overseas channels. The room was serviced every day with fresh sheets and towels. The rooftop pool (free towels at reception) was a refreshing delight with excellent views. 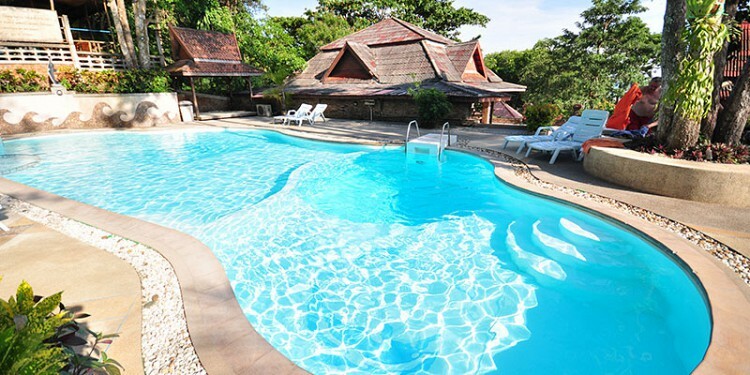 The hotel has 24-hour reception and security, a tour desk and laundry service. The elevator is modern and efficient. Jungceylon shopping centre is about an eight-minute walk away and the madness of the bars and discos of Bangla Road a similar distance. I paid an off-season rate of 900 baht ($37) a night for a pagoda-style private villa overlooking the swimming pool. Prices a few weeks later were down to $20 a night. 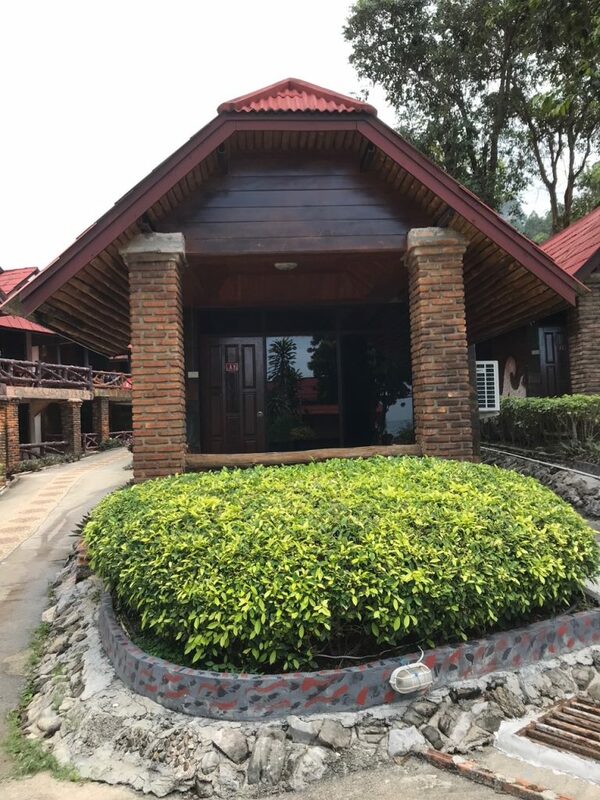 My villa, just 100 metres from the waterfront at Railay East had a comfortable bed, air-conditioning, good wifi (although it was once knocked out by a tropical storm), a fridge, TV with CNN and a wet/room shower that always had hot water. I was provided with fresh bottles of water every day, clean towels and my room was serviced every day, or second day, depending on my needs. Check your room before checking in, as I have seen internet complaints of dirty rooms. That, however, was not my experience. Local mini-marts, massage shops and eateries are within a short walk and I enjoyed sitting on my balcony watching the world go by. There were more expensive rooms more modern bathrooms and facilities but my villa was just fine for basic accommodation. 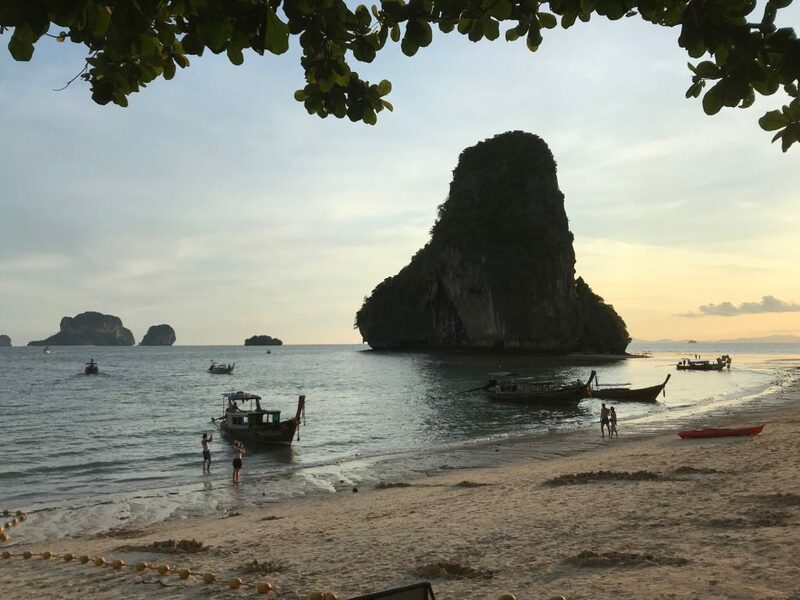 Railay East has mangrove swamps and is not suitable for swimming, but just 350 metres away is Railay West, with its several chic resorts and clean sand beaches. The two are linked by Walking Street, a laneway of restaurants, reggae bars and juice bars and more massage places. Railay can be reached only long-tail boat or speedboat and is popular with day trippers because of its laidback vibe. Dinner will cost you around 100 baht ($4) and there are no loud go-go bars, hustlers or discos. The views are spectacular around these parts with striking limestone cliffs, and clean water that is frequented by squid boats at night. The Crystal Beach, 212/4-7 Soi Keb Sub, Rat-U-Tid 200 Pee Rd, Patong, Phuket, 83150. +66 76 340 342. Railay Viewpoint Hotel, +66 82 4299 090.